I printed the coupons from Targets site and had no problem printing at least a dozen of them. I also have had one checker take 4 in one transaction no problem. I am going again tonight and hope to have the same good luck. Went to two target stores today. Only the toddler wipes were 97 cents. Others were 1.18 and 1.82. Thanks Kristen. I will try that website. I had no problem using all coupons in one transaction. Maybe it means one coupon per item? Also, I printed more coupons off of hotcouponworld.com ..where you can select how many coupons you want to print and they all print out on one page instead of printing 1 coupon per page etc. However, the smaller coupons that printed would not scan, and the poor checker had to type in the number for all 8 of my coupons. Is anyone having problems when printing the coupon from the link? When I go to print it , the coupon itself doesn't come up, just something saying that the image had been moved or deleted. Can you use multiple coupons in one transaction? Will the coupon print multiple times? I noticed the coupon says one per transaction. Does that mean I have to do multiple transactions? Or have people been able to use more than one coupon at a time? 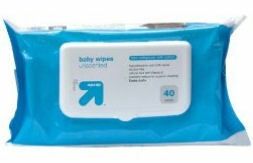 Got the free Up and Up baby wipes today! Felt bad bringing 8 packages to the register and knowing I wasn't going to have to pay a dime, so I found a clearance shirt for my daughter. Not sure why I felt guilty, but I did!